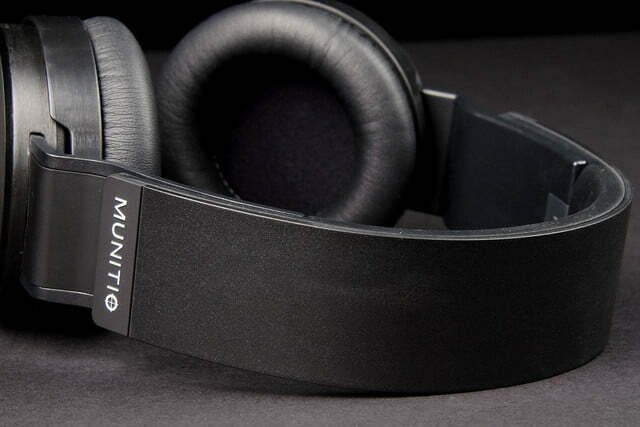 The Munitio Pro40’s easy-listening sound signature, clean instrumental separation, and deep globe of aural spacing kept us thoroughly engaged. So when we received the Pro40, Munitio’s first foray into the over-ear headphone arena, we were a little surprised. 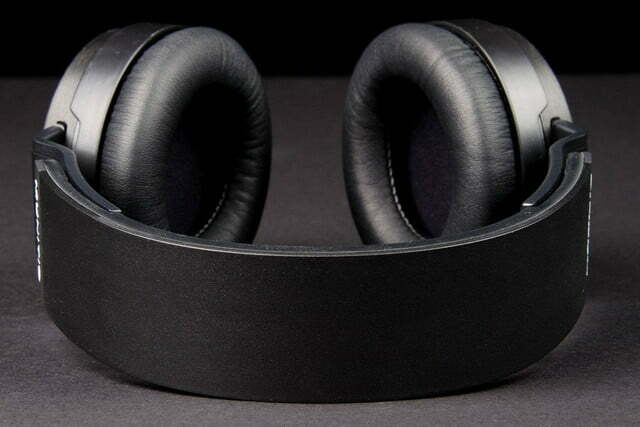 Instead of a mid-tier, game-inspired headset, the Pro40 is a $350, full-on “prosumer” studio reference headset. 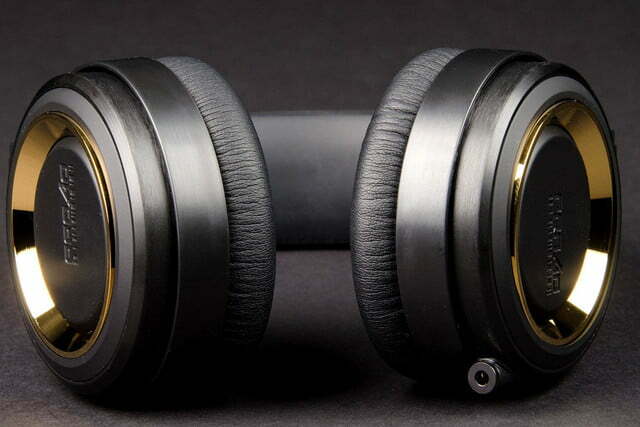 Carved from a sleek chassis of aircraft grade aluminum and high strength polymer and stocked with titanium-coated drivers, these headphones aren’t kidding around. After all, why wade in slowly when you can do a gainer from the high dive? 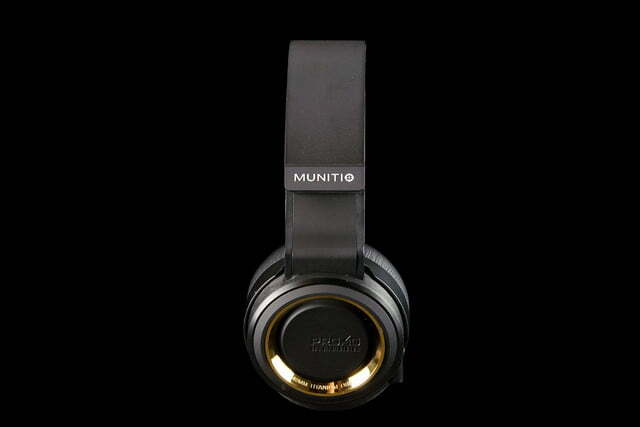 Curious to discover what kind of sound design Munitio has summoned for its new flagship, we slapped them on our ears, and plugged in. Here’s what happened. 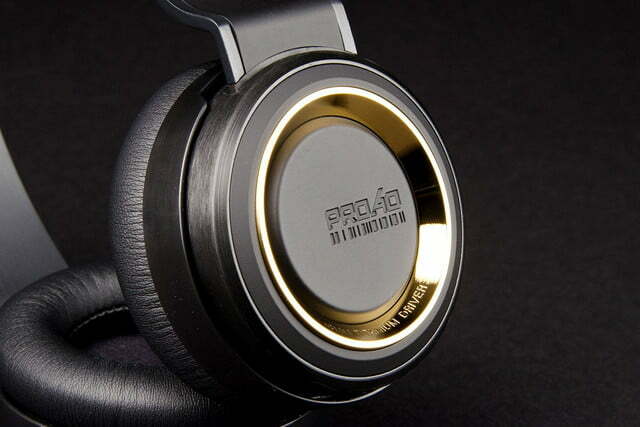 Pulling the Pro40 from the box revealed a chic design with a matte headband and sharp, circular earpieces trimmed in gold. The cans felt heavy as we pulled them from their package and felt substantial in our hands while still offering plenty of give as we gave them a quick bend. Also inside the box was a circular hard case which, in turn, harbored a removable braided headphone cable and a small carabiner. We were surprised to find no 1/4-inch adapter anywhere in the packaging. However, the company is currently offering a free coiled cable with an adapter at the support page of its website. 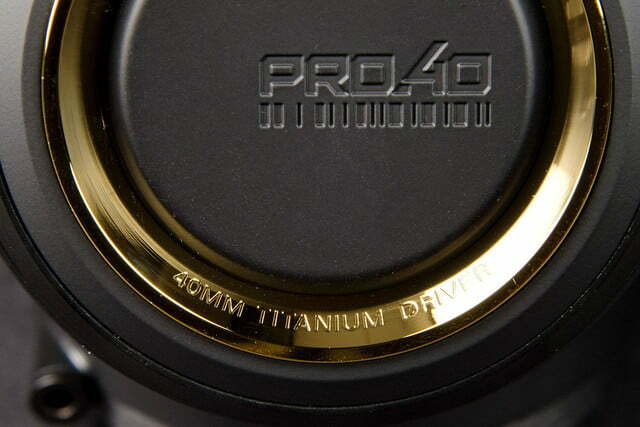 Up close, the Pro40 definitely strike an impression of quality. 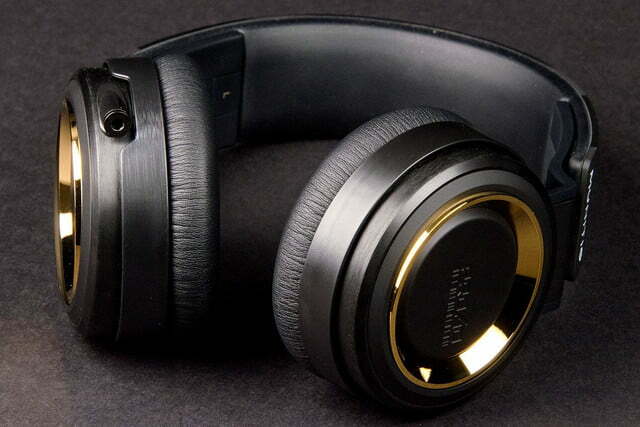 Personally, we’d prefer them in all-black, but the thin gold band that borders the exterior of the earpieces definitely adds a taste of flash without crossing the line to ostentatious. The band is made of titanium-coated aircraft grade aluminum, giving an exterior preview of what’s inside. 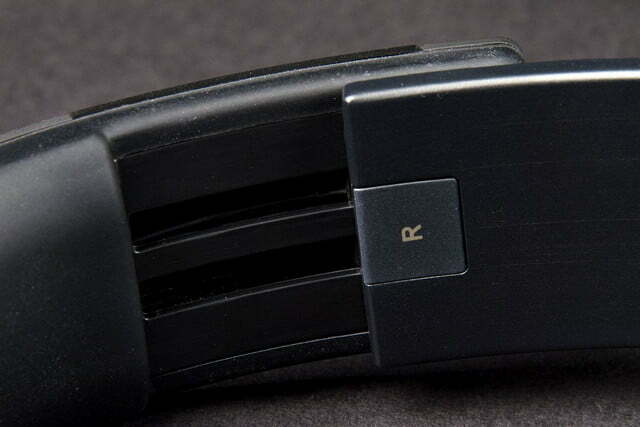 The headband is extremely wide, but it’s also thin, lined at the top with a slim layer of hard foam. 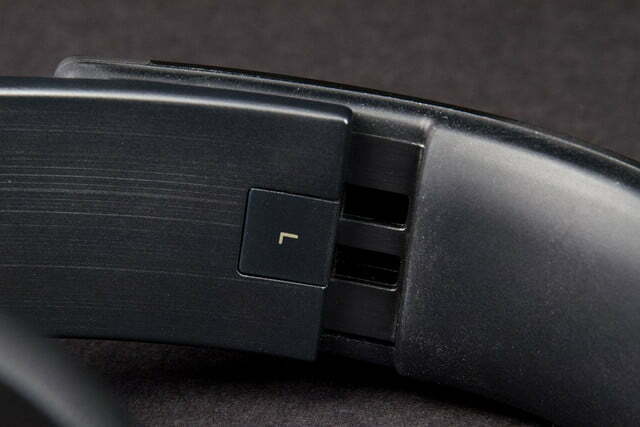 The edges of the band are cut into dual tracks at the underside, upon which the similarly thin extensions from the earpieces slide to adjust for size. The earpieces sit in circular frames that are molded to the extensions and swivel slightly inside their frame to fit to the ear. 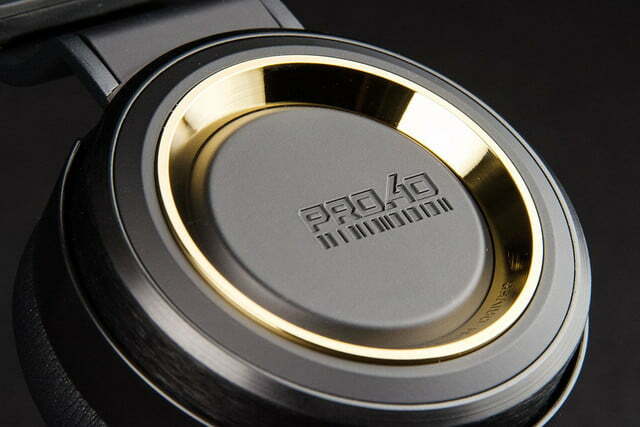 The gold bands that run along the outer face of each earpiece encircle flat discs of smooth polymer, inscribed with “Pro40” logos. On the interior of each earpiece is an ample layer of padding, cloaked in supple black leather. Inside the pads rest the engines that power this ship in the form of titanium-coated dynamic drivers which boast a huge frequency response of 12Hz-20KHz. 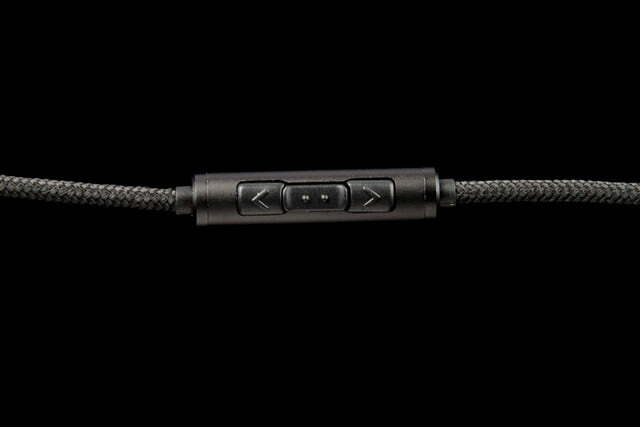 The all-black, Kevlar-reinforced cable is wrapped in braided nylon and attaches at the Pro40’s left earpiece. The cable is approximately 3 feet long, and terminated at each end with dimpled aluminum casings, and gold plated 3.5mm jacks. Though they’re a bit heavy, the Pro40 are plenty comfortable on the ears thanks to a smooth coat of leather surrounding the amply-padded earpieces. The headband wears on the top of the head faster than some we’ve tested, and we wished for a similarly thick layer of padding from the earpads up top. 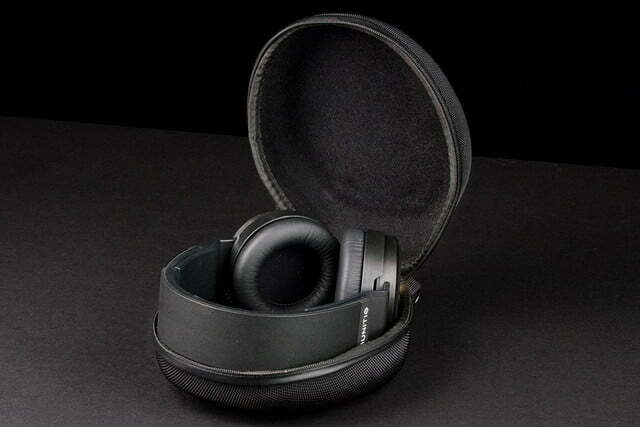 Still, they were easily wearable for a couple of hours at a time, especially due to the headphone’s low ear-fatigue. 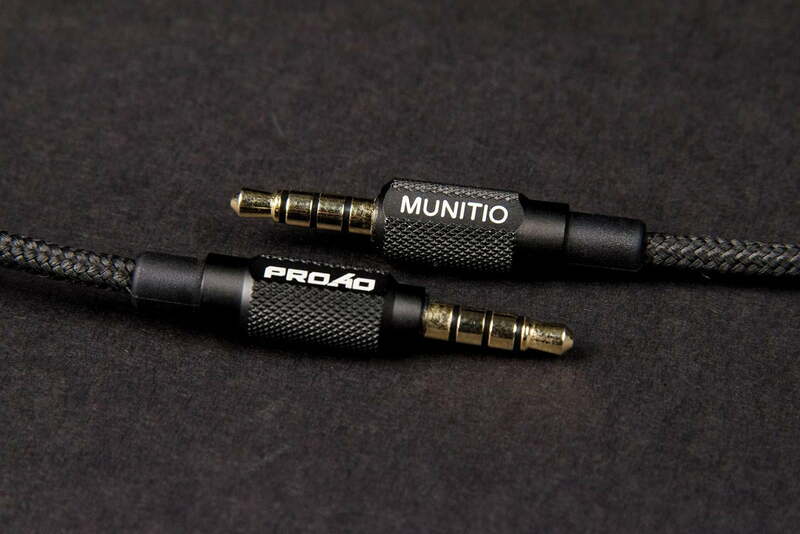 We have to say that, although our past experiences with Munitio’s in-ears have been mostly positive, we had some real trepidation about the Pro40’s quantum leap in both ambition and pricing. However, after just a short period of testing, we were introduced to a well-balanced sound signature, presented with brilliant instrumental separation and detail, and spread across a cavernous stereo image. One of the first indications of the deep dimension to the Pro40’s spherical soundstage came, oddly enough, from the song “Bob Dylan’s Blues.” The track displayed a smooth, well-cut acoustic guitar, and gorgeously present vocals. But the real attraction came from the sweeping harmonica, which was lucidly illustrated each time it entered with an almost fanciful slide from center to left, as if the engineer was just having fun with the pan. Listening on, the keen delineation of each instrument became a key attraction. The Pro40 exhibited a wide spatial display of each layer, allowing us to pinpoint not only each instrument but also the ambient room noises and saturated effects that surrounded them, and with vivid clarity. The effect leant itself particularly well to thick productions from bands like Cake, Radiohead and Vampire Weekend, creating rich, detailed landscapes of sound that expanded into the far regions of the huge aural space. In the Vampire Weekend track, “Hannah Hunt”, we had a blast exploring the deeper textures of the effects and synth patches, supported by a swampy pump of bass, clean vocals, and ghostly-stringed instruments that swayed like seaweed in a current. Radiohead’s “Lotus Flower” offered a similarly striking display of detail, with each patch seeming to reside in its own realm, all gathered together in a circus of sound. The synth patch on the right side at the entrance has seldom been so clearly revealed, sounding like a surgeon’s scalpel scraping against stone. The Pro40 also did an impressive job with midrange instrumentation, specifically piano. 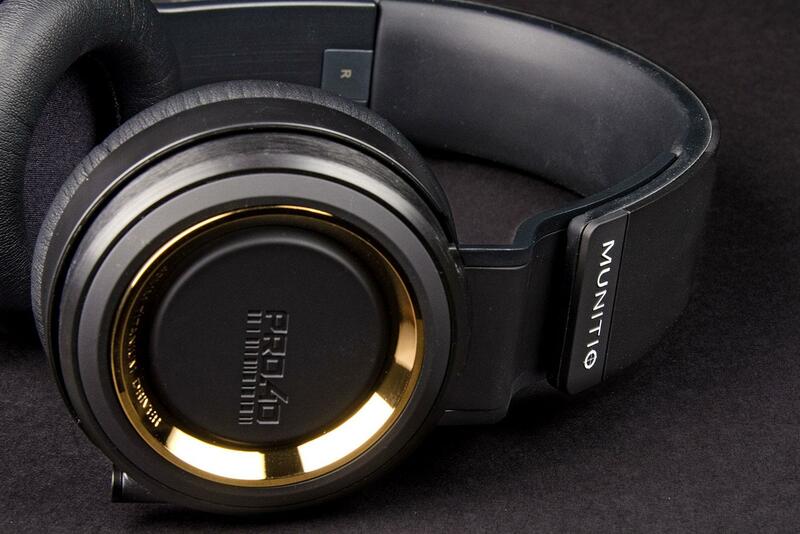 Artists like Elton John and Ben Folds were meant to be heard on headphones like the Pro40, which rendered their rambling keys with a perfect mixture of crystal radiance, and creamy sustain. The result was a tone that was just soft enough to soothe, and just brilliant enough to cut through the chaos. But, not everything was sunshine and roses. The Pro40’s diffusion in the midrange around the 5K frequency prevented sibilance but also muddied the texture at the upper midrange on some tracks. We also wished for more detail in the timbre of instruments at times. Bass and snare on the Beatles’ “Golden Slumbers”, for instance, just didn’t reach that rich, refined color we expect from headphones at this price. 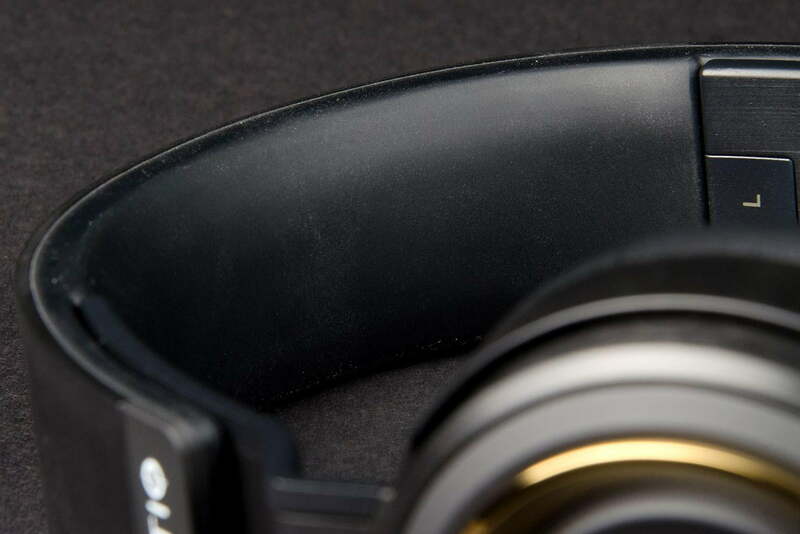 Still, we couldn’t help but enjoy the laser-sharp spacing of the instruments, which continually seemed to defend the headset’s admission price. 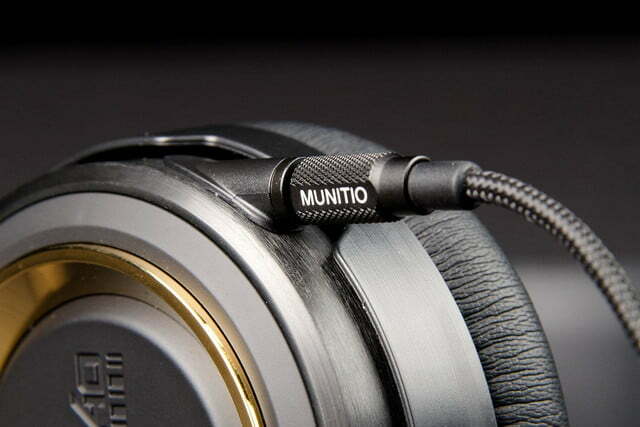 The Munitio Pro40’s easy-listening sound signature, clean instrumental separation, and deep globe of aural spacing kept us engaged throughout our listening. 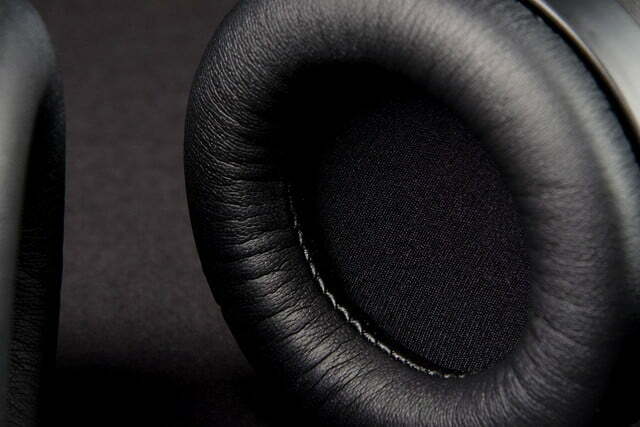 The slight lack of definition in instrumental timbres and the muddy texture that showed up in the midrange keep us from placing the headset on par with our favorites in its class. Basically, the Pro40 is simply overpriced, and we expect the $350 price tag to drop sooner than later. Still, if you want a headset with excellent spacing, deep dimension, and a massive soundstage, Munitio’s Pro40 is definitely worth checking out.